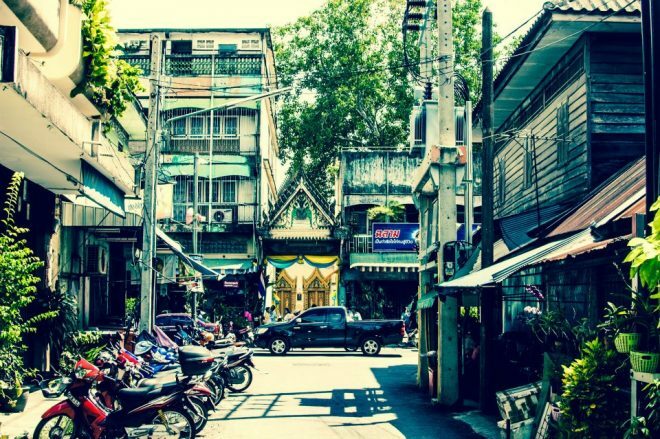 The average Thailand visitor has probably never spent more than a few hours in Surat Thani. As a transportation hub to the east coast Thai islands, most come and go in the same day and never discover the city’s secrets. It’s such a shame! Don’t be like the masses. 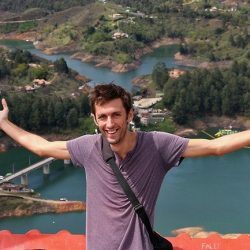 Instead, take the time to explore Surat (as it’s known for short) and you will be rewarded with insanely tasty Thai food, deserted beaches, secret waterfalls, and unique attractions no one else has heard of. It took me a year and a half of living and working as an English teacher in Surat to discover all its hidden gems. Although there is almost nothing immediately aesthetically beautiful about Surat, it still won me over. I feel confident it can do the same for you – if you give it a chance. Surat Thani is the capital of the province of the same name. It’s located on the muddy Tapi River that flows into the Gulf of Thailand. 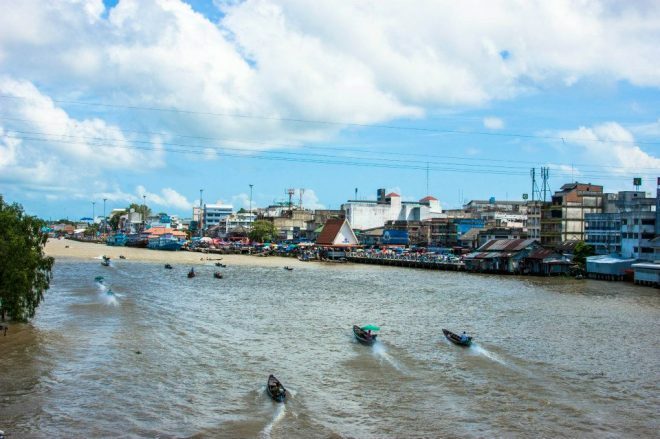 Koh Samui and Koh Phangan are also in Surat Thani PROVINCE, but the city itself is separate. Locals are used to travelers passing through on their way to these islands, so they may be surprised to learn you’re actually staying IN the city itself. 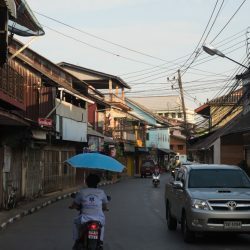 On the outside, Surat is a medium-sized working-class Thai city. It’s known as a pass-through town by island-bound backpackers. It claims significant rubber tree and coconut groves. Doesn’t sound too exciting yet, right? Just wait. Don’t judge a book by its cover. 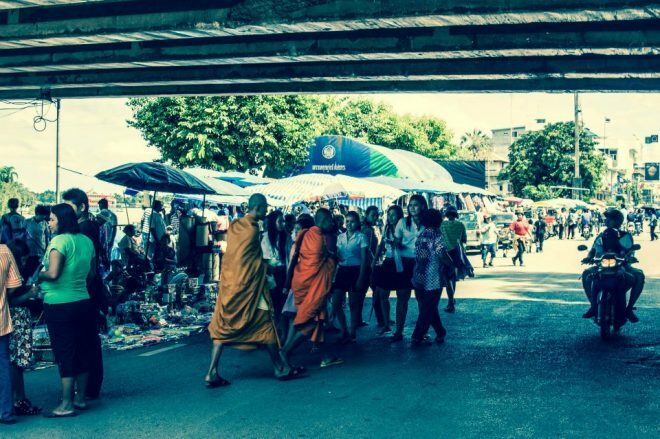 Hang around in Surat for a while and you’ll discover it’s the location, abundance of original day trips, authenticity and literally the best Thai food ever that makes Surat such a special Thai city. Koh Phi Phi -4-hour train/boat combination leaving from Surat Thani Train Station. 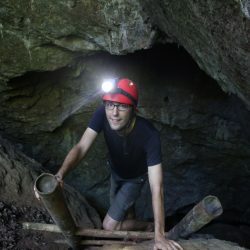 SO – before you take off for that Full Moon Party on Koh Phangan or take your Open Water Diver course on Koh Tao, adjust your schedule and spend more time in Surat Thani. Take advantage of being in town and check out all these awesome day trips you can take within the city. 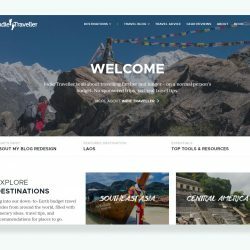 Below are 4 unheard of destinations within Surat that you definitely won’t find in the guidebooks. Khanom – a sleepy oceanfront town with gentle winding roads, pristine coastal scenery, deserted beaches, a late-night reggae bar, and cheap beach bungalows. Truly undiscovered by tourists, the only foreigners you’ll see in town are ex-pats and English teachers – and you’ll find them partying it up beachside at Jam Bay Reggae Bar. Khanom is just 1-hour by motorbike or minibus east of Surat. Chaiya – a tiny fishing village surrounded by rubber tree groves and littered with temples and ancient ruins. 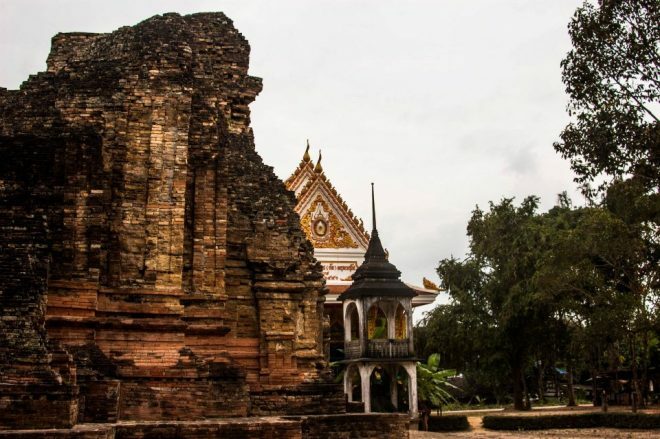 Wat Phra Borommathat boasts particularly impressive architecture while Wat Kaeo displays an interesting contrast between old and new. Continue moving through town to the Silk Village, a dusty road of just a few hundred meters. 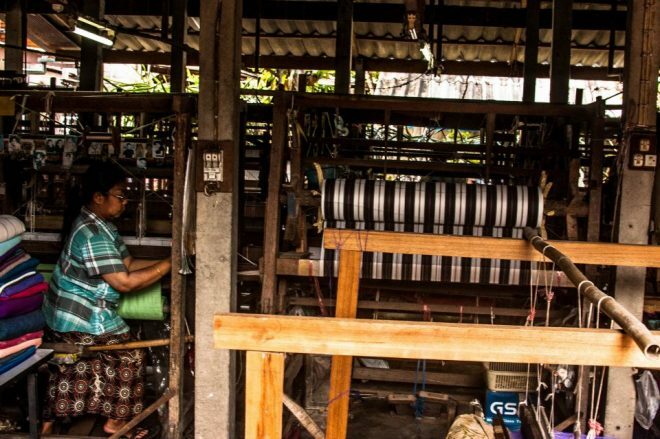 Here you’ll find 100% hand-made pure Thai silk blankets for a ridiculously low price. You can even wander into the back of the shops to see the local women making them. Cap the day by heading to the pier and dine on fresh seafood. Chaiya is just 1-hour north of Surat. 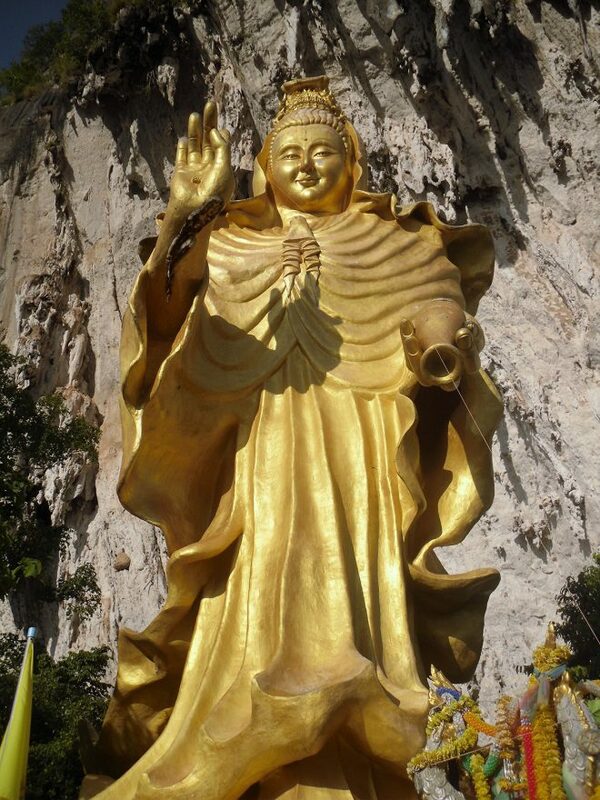 Wat Tham Singkhon Cave Temple – the massive golden Buddha temple guarding the entrance to a mysterious cave shrouded in jungle greenery. The reward of making the 1-hour trip from the city center is coming back from Thailand with zero tourists in your impressive temple pictures. Dat Fa Waterfall – craving some time alone in the dense nature surrounding Surat Thani? 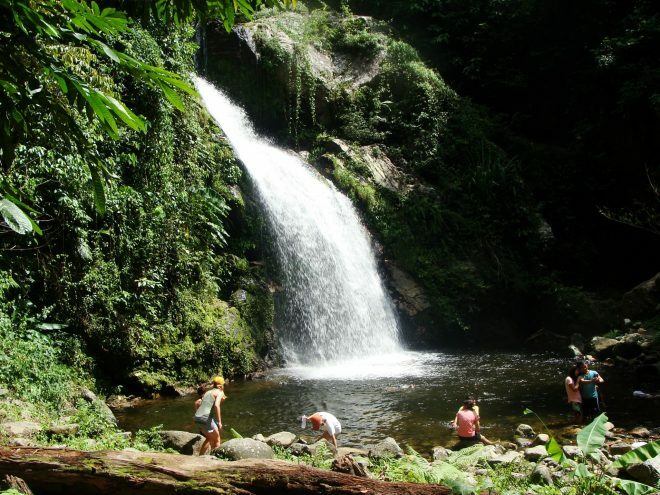 Rent a motorbike and head 1-hour south of the city to Dat Fa Waterfall, accessible with an easy-going trek through the dense jungle. The chilly swimming pools and cliff jumping will get your blood pumping. If you want a glimpse of “real” Thailand, rent a motorbike and spend a few days buzzing around Surat city center. Because Surat is relatively untainted by tourism, there’s plenty of authentic culture to enjoy. 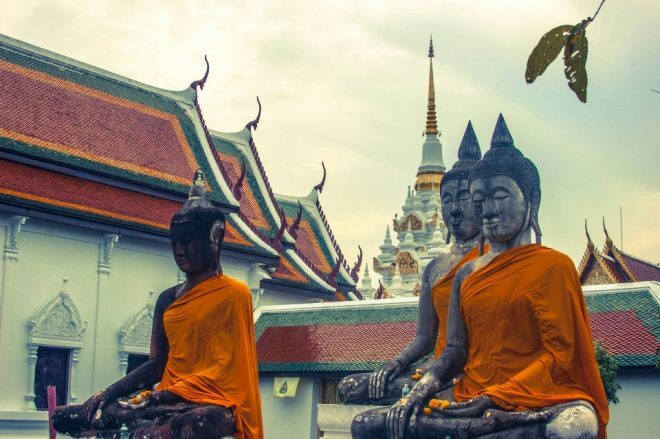 Check out the Monkey Training College, drink beers with the locals at the Ban Don Pier, discover the impressive Buddhist and Chinese temples, or hire a longtail to cruise the Tapi River canals. The Monkey Training College – This is a real highlight of Surat. This school was founded by local coconut farmers for the purpose of training monkeys to harvest coconuts from the treetops. You can visit by appointment only and view the training and interact with the monkeys. 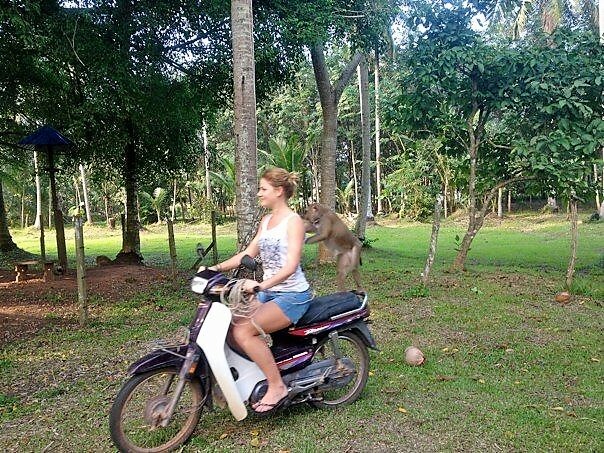 You can even ride a motorbike around a dirt track with a monkey standing on the seat and holding your shoulders! The monkeys are always rewarded for their efforts and well taken care of by the kind staff. It should be noted that the Monkey Training College wholly believes in the humane treatment of their “students.” If the monkeys become agitated at any time, the tour will wrap. Insider tip: buy the cold-pressed coconut oil made on site! Pier beers –Ban Don Pier (AKA the Night Boat Pier) on a Friday or Saturday night is the place to be. A simple platform over the water set up with plastic chairs and metal tables serves as a super laid-back hangout. 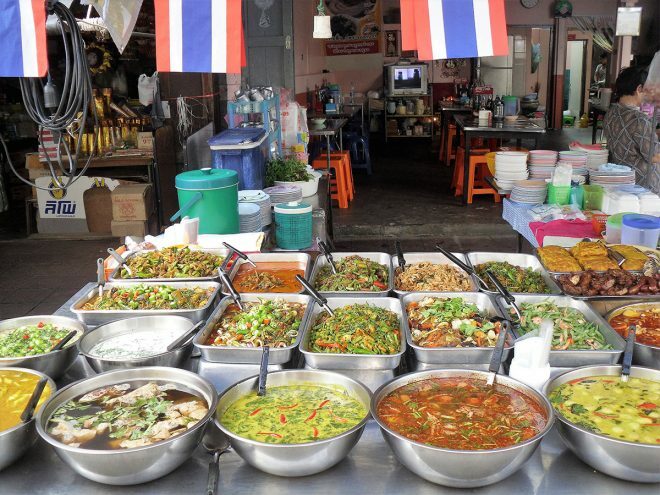 Cheap beer and street food are available from a dozen nearby stalls lining the road. You’ll also find travelers hanging around here as they wait to board the night boat heading to Koh Tao. Post up and stay a few hours and you’ll probably make some new friends. 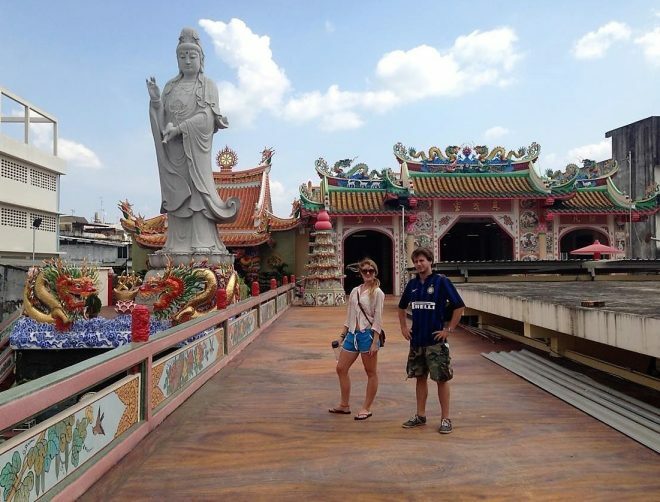 Temple tour – There are lots of little temples and shrines around the city. 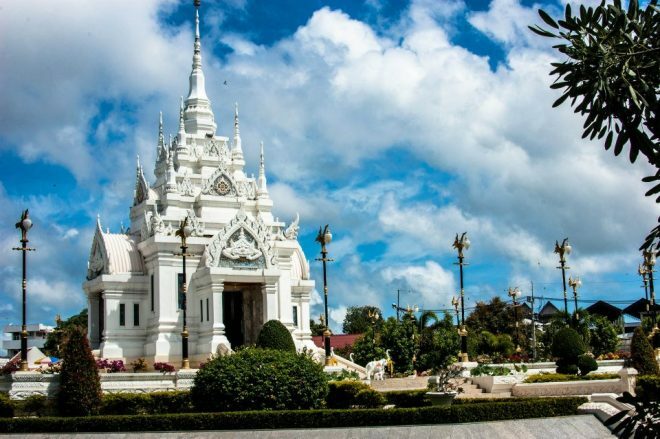 One of my favorites is the white stone temple on Tambon Talat called Surat Thani Pillar Shrine. Another worthy picture opp presents itself at the towering Guan Yinstatue inside the impressive Sanjaojao Maeguan-im Chinese temple. Find it directly across the street from the Coliseum Shopping Center on Namueang Road. 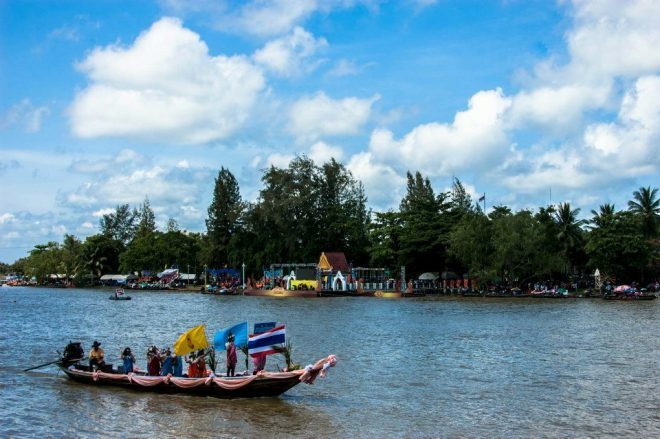 River tour – hire a local longtail boat from near the pier and ask for a Tapi River tour. Your captain will guide you through the jungle-fringed canals while you take a peek at what rural life is like in Surat. 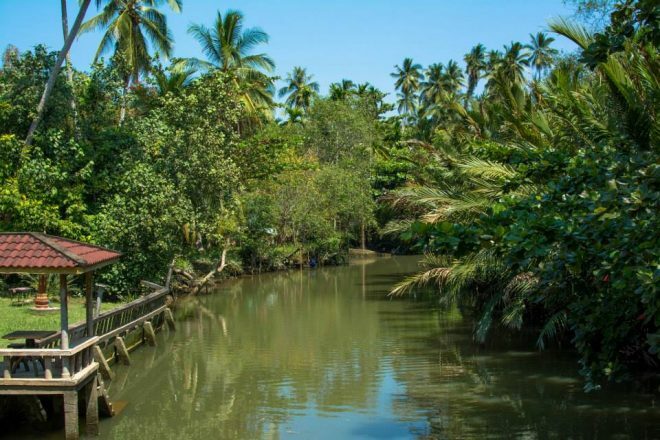 Along the banks of the muddy river, you’ll find stilted homes, lush coconut groves, and even a few homestays if you want to spend the night away from the city. Keep your eyes peeled for the prehistoric-looking Monitor Lizards. If for nothing else, come to Surat for the Thai food. The city brims with pokey hole-in-the-wall restaurants and street markets. These are almost always the best places to eat. Hint: you won’t find much in the way of western food, and what you do find won’t be very good. Eat local! The easiest and cheapest way to fill your stomach in Surat is at the Night Market. Located on an offshoot of one of the city’s main drags, Namueang Road, this nightly market is heaven for budget backpackers. It also offers some of the best food in the city. Highly recommended: sticky Pad Thai noodles, spicy papaya salad, and noodle soup. Save the rolled Thai ice cream or fresh-cut fruit for dessert. The best part is you’ll be stuffed for only a couple bucks. Find the Night Market: Use My Place @ Surat Thani Hotel as a reference point. If you’re standing with your back to the hotel, turn to your left and walk two blocks. Insider tip: For a real treat, hit the Issan-style restaurant hidden on the less populated side of the Tapi River. To find it, start from the “night boat pier”, look across the river to your left and see the bridge. Walk across the bridge and it’s the very first restaurant on the right after you reach the other side. Order crispy pork, papaya salad, fish in lime sauce, and sticky rice. 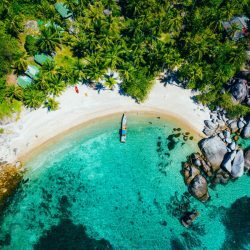 Chances are you plan to party or scuba dive on the east coast Thai islands or check out the famous rock climbing and limestone karsts and beaches on the west coast. And you definitely should. But my advice is this: instead of blazing through Surat and paying it no attention, commit to spending a few days in town. 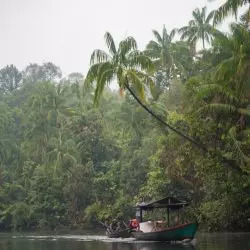 This is your chance to see a sliver of real Thailand – a side that’s slowly and sadly being buried by tourism throughout much of the country. Enjoy Surat while it’s still special. Rent a motorbike. Hike to the waterfall. Drink beer on the beach in Khanom. Take dozens of tourist-free photos. Indulge your taste buds.